The Institute of Banking Personnel Selection (IBPS) has released the CRP- SPL-VIII- Specialist Officers preliminary result. The IBPS SO Prelims results was declared on the official IBPS website. Candidates can click on below link to check your results directly. IBPS Specialist Officer is a very booming career option for individuals who have completed their post-graduation/MBA and interested in banking career. Institute of Banking Personnel Selection (IBPS) will conduct the Preliminary examination on 29th and 30th December, 2018 and the Mains examination on 27th January, 2019. The preliminary exam of IBPS SO will consist of Reasoning Section, Quantitative Aptitude, General Awareness and English Language. The IBPS SO mains exam will test the candidates on their professional knowledge. Candidates qualifying the preliminary exam will sit for the mains exam and those who qualify both the former stages will be called for personal interview. 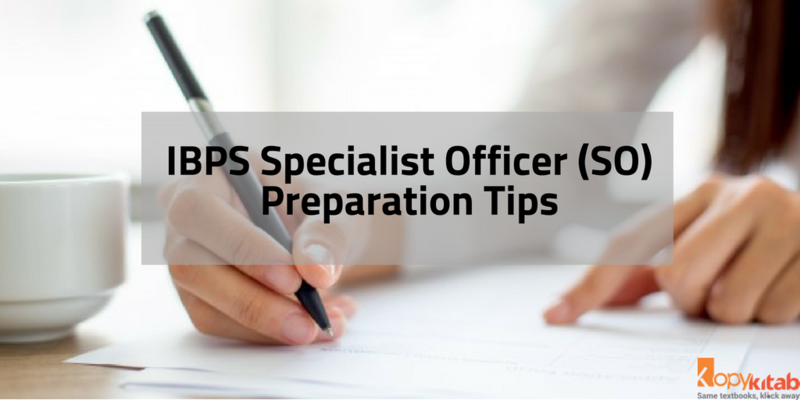 Though the syllabus for all the sections of IBPS Specialist Officer is not expected to change much, but there might be some changes happen in the number of question and time duration. So to make yourself prepare for all these circumstances, KopyKitab provides section wise preparation tips. Check all the tips given bellow. Reasoning section is one of the most scoring section if attempted properly. Candidates will have to put more focus while preparing and practicing for the section. Candidates should paid more attention to analytical reasoning. If candidates forget the shortcuts, all the preparation done by them will be futile, therefore candidates need to practice hard and practice daily. Quantitative aptitude section is considered as the more important section among all kind of bank exams. It is regarded as one of the toughest section but if you have prepared really well then you will be able to tackle all the questions very easily. Candidates will be required to solve situational questions in this section. It will test your mathematical ability and to score well in this section one must practice as much questions sets as he can. The person also need to learn all the tricks and shortcuts to solve a problem within a specific time limit. General Awareness section is regarded as the easiest and high scoring section of IBPS SO Prelims. To score high in this section one must need to be stay updated with the latest news and information that’s happening both nationally and internationally. And to stay updated, candidates should check the news, read the newspaper on daily basis and jot down important events with all details. Reading the monthly GK Books and magazines will also help them to stay updated. Along with that candidates should also give more focus on to the news related to Finance & Banking. This is one of the easiest section of IBPS SO. But don’t take it for granted because this is the section where most of the candidates fail. Some are not even able to clear the cut-off because of their mere negligence. The questions in this section are very basic and goes back to the syllabus of class 10th. For this section candidates need to practice more and work on their grammatical skills. Daily at least one hour of practice will work for it.